Newest products and prototypes were shown at the exhibition area during all coffee breaks. 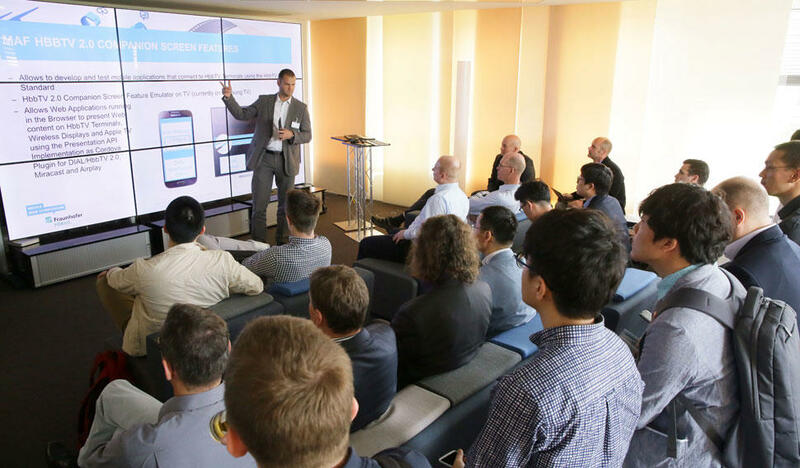 Find out more about the latest developments and use cases as well as exchange latest technical information and hands on experience of multiscreen content and applications. Experts and innovators in adaptive streaming video technology! The Bitmovin team co-created the MPEG-DASH standard, and as such has a deep insight into the technology that drives today's online video industry. Bitmovin has been first movers in many of the important technological advances in the industry. The Bitmovin Cloud Encoding Service offers a scalable cloud infrastructure capable of encoding up to 100x faster than any other service. The Bitmovin Adaptive Streaming Player uses patented software technology to predict and avoid buffering better than any other player on the market. All products support MPEG-DASH and HLS as well as DRM integration, Ad servers, HEVC, VR and 360° and much more. Break new ground of storytelling and monetize your videos: Enrich videos with value-added information, branch among themselves and analyze your audience. Platform as a Service powered by non-linear video technology including CMS, Interactive Player, Annotation Editor and Analytics. 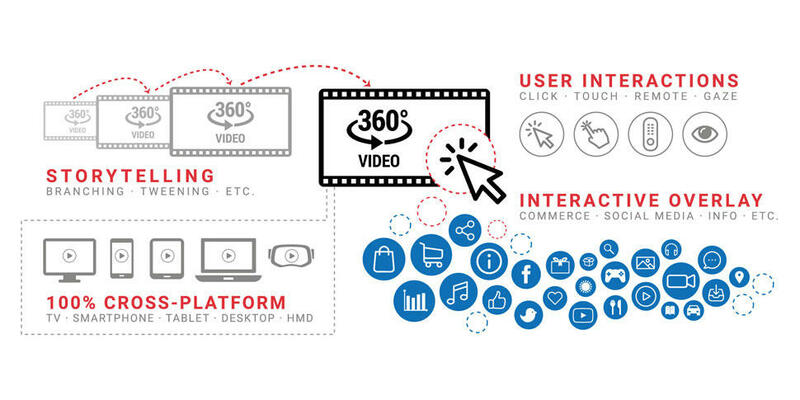 Cross-platform solution: Interactive 360° content may be distributed to SmartTVs, Smartphones, Tablets, HMDs and Desktops. Seamless integration into your own services and applications: Break free your branch of economy for a new world of interactive 360° video experiences. The Fraunhofer FOKUS Cloud-based 360° Video Playout allows to watch high quality 360° videos even on devices with constrained capabilities such as HbbTV TVs. The delivery of this huge source video material consumes a large bandwidth and results in a considerable processing load for performing the geometrical view projection and rendering. For example, a bandwidth of more than 300Mbit/s is required to stream a 16K 360° video and it takes few seconds to render a single 4K FOV frame from the source 16K equirectangular frame which makes a smooth playback impossible - even on modern devices with high processing and graphical computing capabilities. 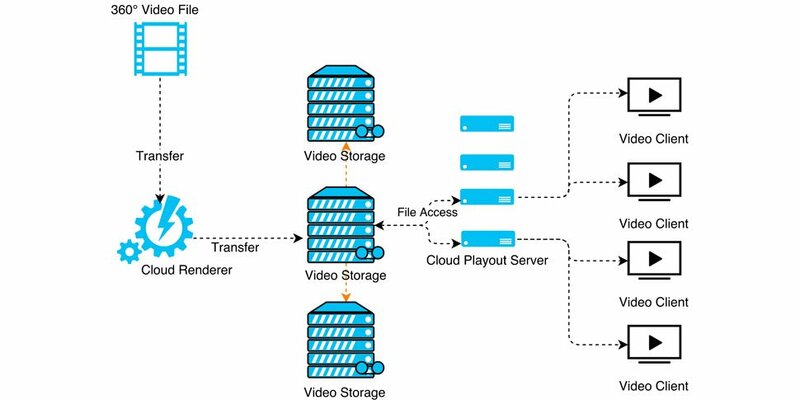 Our solution addresses both aspects and reduces the required bandwidth and processing resources by rendering the field of view from the source 360° video in advance and streaming only this to the client. By doing so, many features which are applicable to classical videos can be also applied to the FOV videos for example Field of View Adaptive Streaming using DASH and MSE, Efficient Delivery over existing CDNs and DRM Support over EME. Cross-Platform Support: HbbTV, Smart TV, Android TV, Chromecast, Apple TV, Desktop and Mobile Browsers and many others. DASH support allows to adjust the playback quality to your bandwidth, especially important for large UHD 360° videos. 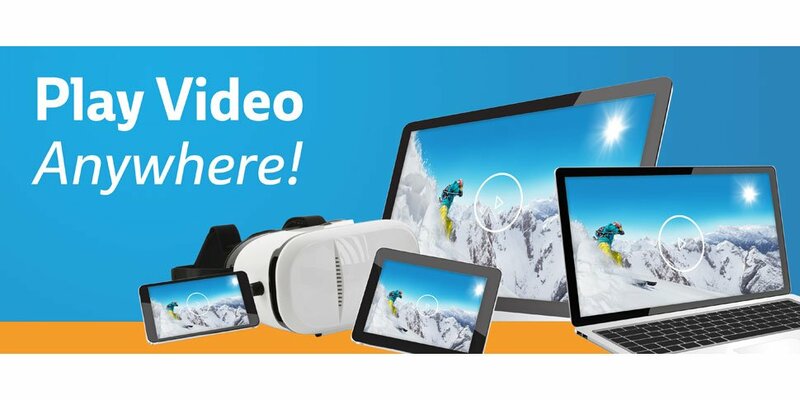 Support of 16K 360° videos with a 4K Field of View. Add interaction to 360° videos and allow users to control the experience. Try our Editorial Tool and easily enrich your videos with interaction. Unlike other 360° video playouts our system saves bandwidth while delivering best possible quality due to the preprocessing approach. Go for a test drive and explore the newest 360° videos, Virtual Reality videos and gaming to name a few. Get the latest insights in the newest developments and technical capabilities. Enjoy 360° videos on TVs via HbbTV or Apple TV and understand the differences and issues behind each solution in our Lounge. Explore Smartphone Apps with rich 360° video libraries as well as 360° video cameras to record or livestream 360° videos, which we will show and explain during the event. Our Lounge also provides the newest devices to experience Virtual Reality Video Content on different platforms such as Google Daydream View or Samsung Gear VR. Virtual Reality Gaming is also a very exciting technology, that will be available for you to experience in our Lounge with a PlayStation 4 Pro and PlayStation VR Headset. Our Lounge provides a platform for technical experiences and discussions with our experts. Come in and explore it at our exhibition area. Based on the HbbTV Application Toolkit (HAT) presents an editor and CMS for the creation of HbbTV applications, which allows content creators without specific technical skills to build interactive TV applications. It is is developed by the EU funded MPAT project, coordinated by the Fraunhofer FOKUS' Competence Center Future Applications and Media (FAME), including rbb (Germany) and Mediaset (Italy) as broadcast partners. MPAT is based on the popular WordPress platform and adds HbbTV capabilities by means of themes and plug-ins. It offers the content creator three different navigation models, including the popular Slide Flow navigation and a set of functional modules to support additional features, like the inclusion of social media. MPAT has been used by German broadcaster rbb for the creation of the HbbTV application supporting the “Band Camp Berlin" series (shown on the KiKa channel in Nov/Dec 2016), the 25th anniversary edition of “Brandenburg Aktuell" and for the continuous backing support of the “Täter Opfer Polizei" real-life crime series. Mediaset has used MPAT for interactive advertising and for a VoD playout portal. At MWS 2017, we will demonstrate the application of MPAT in a real broadcast workflow using the on-air scenarios by rbb. 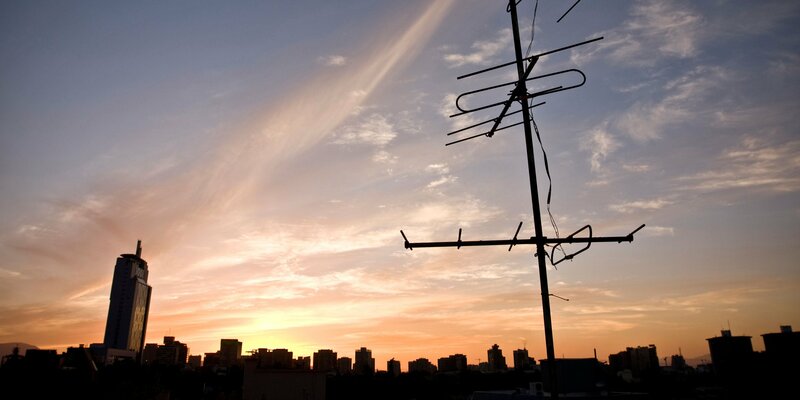 MPAT can be installed by broadcasters on their local servers if required, but it is also available as a cloud service instance for immediate use and full scalability, covering the full range from small tests to multi-million viewership. Fast and easy creation of programme-related HbbTV applications. Provides a set of App templates tailored to the TV screen. Supports three navigation models Editing is based on WordPress. Content can be added via an easy to use web interface. Broadcaster's own CMS can be supported via Asset Converter. Supports HbbTV app developers by offering templates and modules like interactive video and photo gallery, text, menus, social media and companion screen support. Available as self-hosted version or as scalable Cloud solution. SAND metric reporting is an important tool for content providers as it enables players to provide streaming performance information like average throughput, buffer level, representation switch events and initial playout delay (QoE metrics defined in ISO/IEC 23009-1). SAND shared resource allocation allows network components to control how much bandwidth a client should use. This is useful in scenarios in which multiple DASH clients share the same network and compete for the available bandwidth. 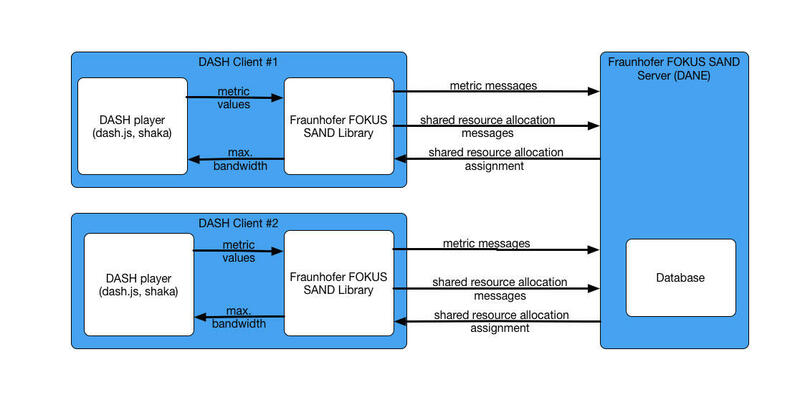 FOKUS open source libraries (SANDLibrary and SANDServer) cover SAND metric reporting and SAND shared resource allocation. The “FAMIUM DAI Service" is an end-to-end solution for ad-insertion in MPEG-DASH and HLS. The flexible chain consists of multiple micro services, that can easily be deployed and replaced and integrate well with existing components. Our solution wraps the complexity of the ad-insertion process into a simple, easy to understand management interface. It supports different ways of ad insertion, namely server-based and app-based ad insertion. The service covers the latest MPEG-DASH ad-insertion techniques like XLink and DASH inline and inband events. Moreover, it has support for ad signaling mechanisms like SCTE35 and ad server standards like VAST, VPAID and VMAP. Our tools can be used to target different platforms, including HTML5 browser, HbbTV 1.5/2.0 devices and native DASH and HLS player running on Android, FireTV or Chromecast. 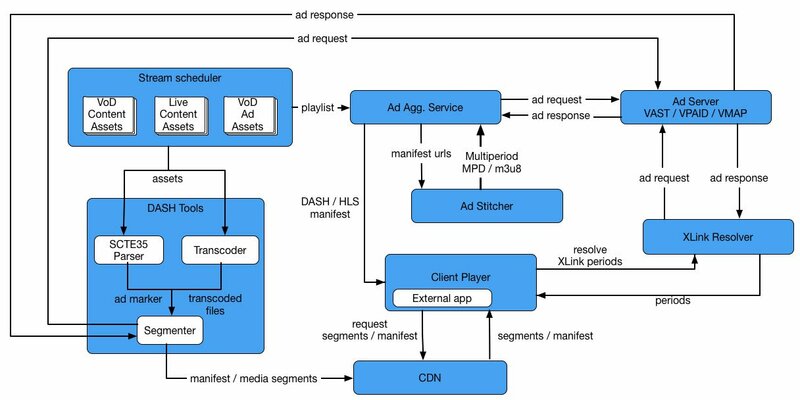 Easy to understand interface to manage the whole ad-insertion workflow for MPEG-DASH and HLS. Multiple micro services that can easily be deployed and replaced. Flexible service chain to target different ways of ad insertion (server based and app based). Integration of existing ad server standards like VAST / VPAID / VMAP. Support of latest DASH ad insertion techniques like XLink and DASH Inband / Inline events. SCTE35 support for ad signaling. Targets different platforms: HTML5 browser, HbbTV 1.5/2.0 devices and native DASH and HLS player running on Android, FireTV or Chromecast. The Broadcast Probing System offers cloud-based continuous monitoring of DVB (T/T2/S) broadcast networks by utilising low-cost devices equipped with receiving capabilities, so-called probes. Controlled either individually or in groups, the probes are securely instructed to execute scheduled jobs like scanning through frequency ranges, tuning to desired channels or fine-grained inspection of transport streams. The collected spatiotemporal data links radio frequency characteristics (e.g. signal-to-noise ratio) and stream quality (e.g. bit error rate), multiplexed service information tables (e.g. AIT/HbbTV, EIT/EPG) and audio/video bitstreams to allow for live analysis and subsequent evaluation covering many locations of the broadcasting area simultaneously. Beyond the real-time access to the tracked broadcast status information, the data is processed and condensed by the cloud portion of the system. Deviations from the target state are identified and can trigger well-defined actions supporting the optimisation of the overall service operation. The main purpose is the cost-effective and near real-time service monitoring at lots of locations to support the detection of faulty conditions. Also, the system supports evaluations with queries like “What was the average packet error rate for a given channel in a certain location yesterday". Moreover, the tracked probing data can be used for inter-regional comparisons, traceability or linkage with other data sources, e.g. to support derivation of correlations. Offers the missing feedback channel for DVB networks to detect potential misconfigurations and service degradation. Provides near real-time monitoring of broadcasted digital services. Enables access to current and tracked historical data. Processes AV, status and meta data using automated jobs to check the quality in the field. Covers the reception area using low-cost mini computers installed at many locations.